Many students are limited to “learning” Shakespeare by studying only one of his many plays. Now you can help students come to a more complete understanding of the world’s most famous playwright by exposing them to five of his most recognizable plays and the beauty of his language. This wonderful book contains fifteen cuttings from Romeo and Juliet, The Merchant of Venice, Julius Caesar, Othello, and Hamlet. Each scene is preceded by thorough setting and character descriptions as well as a complete plot synopsis. All scenes have between two and seven characters and run between 15 and 25 minutes in length. Read more...This is the ideal book for a class that only has three to four weeks to study Shakespeare as well as for groups of students looking for performance materials, whether for contests, auditions, or acting workshops. Now you have a choice! The same methodology used in the original Scenes From Shakespeare has been applied to six more of his classic plays: Macbeth, Much Ado About Nothing, A Midsummer Night’s Dream, King Lear, As You Like It, and The Taming of the Shrew. Like before, each of these 20 scenes incorporates between two and seven characters and lasts between five and twenty minutes. Cuttings are preceded by a list of lead and supporting characters and a detailed description of what has occurred thus far in the play. 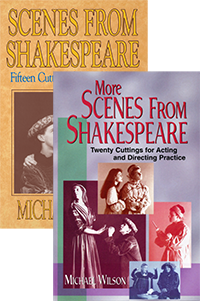 These are ideal for contests, auditions and acting workshops, as well as for the study of Shakespeare on a tight timeline. SPECIAL OFFER! Buy both books for $23.00! These are ideal for contests, auditions and acting workshops. Cuttings are preceded by a list of lead and supporting characters and a detailed description of what has occurred thus far in the play.